Step 1 – Melting chocolate. Say what? Isn’t that what we were supposed to make? Yes but even when we make a salad, we don’t grow vegetables ourselves. We just chop and mix stuff. To learn how to melt chocolate go here. I couldn’t have explained it better myself (Use chocolate Compounds for this purpose. I used MORDE Dark Chocolate Compound and melted it in BOROSIL microwave safe cookware). 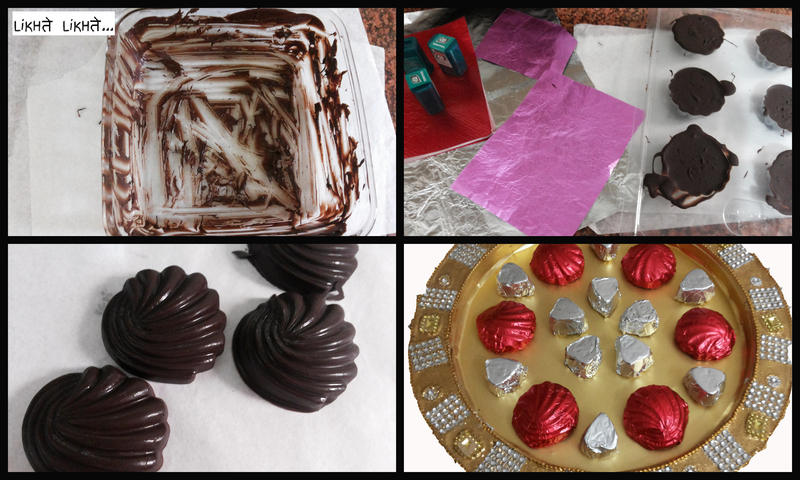 To make plain chocolates, use Chocolate essence (Make sure any essence you add is oil based). This is the step where you can make this chocolate your own, experiment and go crazy. Add nuts, biscuit crumbs, strawberry essence or rice crisps. I mixed in some crushed TIC TAC SPEARMINTS for a minty flavour. Put above chocolatey awesomeness in moulds (Plastic ones, Ice trays anything!) of desired size and shape. No greasing required whatsoever. Set it in your refrigerator, not necessarily the freezer. It takes about ten minutes. You will know its set by looking at the bottom of the moulds, chocolate tends to contract away from the moulds. Just overturn moulds on your counter-top, they should come away easily. A gentle tap if they are being stubborn 😛 Wrap chocolates in colourful wrappers (from any bakery or confectionery around) and place them in baskets/trays etc.